The Samsung Gear VR is a Virtual Reality headset designed to work with Galaxy Note 4 smartphone using Oculus Rift technology. The headset uses an accelorator, gyrometer, magnetic and proximity sensors to enable interaction with a virtual environment by moving the headset using the same technology as the Oculus Rift. On the side of the headset are a number of controls including a touch pad, back button, and a volume rocker. Focal adjustment can be also be undertaken on the system. VR Content can be viewed through an Oculus Home App. The systems has a 96º degree viewing angle. The Innovator Edition is available in two editions; one which just consists of the Gear VR costs £185 with a second containing a Bluetooth gamepad for controlling content within the VR environment costs £240. Like other VR systems it could be used to remotely view immersive photos/videos of excavations/cultural heritage. Unlike the Oculus Rift the system is wireless. The Gear VR is designed to only work with the Galaxy Note 4, if the user already owns one then it is only an additional of £185, but the phone itself costs £600 making it an expensive purchase for use with the Gear VR. Although technically it has greater potential than Google Cardboard the fact that it only works with one phone severely limits its user-ability. The system cannot be connected to a PC so all material has to be downloaded via the phone. Google Cardboard are VR (Virtual Reality) goggles made out of cardboard using an android smart phone as the central processing unit and display via the Google Cardboard App. The cardboard shell can either be purchased for less than £10 complete with lenses and magnet button control or the cardboard design downloaded from the website and the other parts purchased separately. The mobile phone provides you with orientation tracking using a gyroscope and accelerometer built into the phone which means that the the app can track the movement of the user’s head updating the imagery on the phone depending on the direction that the user is facing. A magnetic trigger on the outside of the cardboard allows interaction with the VR environment by effecting the magnetometer in the phone. Although with calibrated magnetometers this can only act as a single button, with uncalibrated magnetometers incorporated in newer phone there is greater variety of abilities with the possibility of incorporating a joypad into the outside of the case. The Google Camera App (On Android 4.4 and later) can record 360° Photo Spheres which can easily be viewed in the Google Cardboard App on the smartphone, other Photo Spheres can be viewed be editing their file names. The app can also view videos on YouTube including those designed for the Oculus Rift or other VR Gear with two separate views in the video. Integration with Google Earth and Google Maps Street View is also possible. The first is the Cardboard SDK for Android which allows VR applications to be quickly created in OpenGL. The second is the Cardboard SDK for Unity which allows an application created in the Unity 3D game engine to be viewed in the Google Cardboard Goggles or to design one from scratch. Although designed for phones with the Android operating system, phones using iOS can also be used in the Google Cardboard using Durvois Dive (a plastic VR Goggle frame which also uses smartphones) apps. Google Cardboard was designed to both allow the cheap and easy ability for almost anyone to view VR and to help push forward development of the systems. It has the ability to both view virtual reconstructions of sites and view still 360° photographs and immersive videos of sites, these can easily be downloaded and viewed by anyone anywhere in the world using the technology. The fact that the phone can be used to create 360° Photo Spheres as well enables the both the recording and viewing of views of cultural heritage and excavations with technology that may already be owned. Because it uses a smartphone there are limitations to its abilities that would not be there with more powerful computer systems. The quality of the imagery is also completely dependent on the quality of the smartphone screen. Although the control is limited to the one button on the outside of the Google Cardboard some wi-fi/bluetooth game controllers can be used with Android operating systems allowing much more interaction. There have however been problems with the button working, particularly on certain models, it is after-all a technical workaround to use a device for a function it was not designed for. An additional mount can be purchased which connects the Leap to the front of an Oculus rift allowing the control of a virtual environment. The Leap Motion Controller costs €89.99, an additional mount for the Oculus Rift can be purchased for an additional €14.99 or together for €96.99. While an HP Leap Motion Keyboard can be purchased for €99.99. 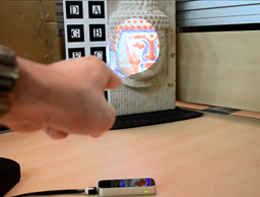 The potential of the Leap in the field of Spatial Augmented Reality within a museum environment has already been demonstrated with the MANAO Project as part of the V-MUST Project (Virtual Museum Transnational Network) where a Leap Motion Controller detects a finger that is pointed at an object replicating a virtual torch, the outline of the torch is displayed on the object using a video project which projects the original colours onto the surface of the object. This has already been used in the Allard Pierson Museum in Amsterdam as part of the Keys2Rome international exhibition, it can be seen at 1 minute 22 seconds in the following video. The Leap has great potential for the control of both GIS and 3D modelling software where the movement and rotation of views could be controlled with simple hand movements. But it also has the ability to add interaction into a virtual reality environment by combining it with a system such as the Oculus Rift where immersive environments created from other recording techniques could be interacted with. It is slightly larger than a USB stick and plugs into a USB cable with no other power requirements, so is very portable. The Leap is designed to read hand and finger movement, this of course limits what it can read unlike the Microsoft Kinect which can read whole body movement.